Just about all of the costume jewelry research sites linked in one place! No more then one bookmark to make! Researching Costume Jewelry An extensive resource with jewelry history, pictures of marks and signatures. Eclectic Vintage Research Information, Jewelry Repair Tips & More! A mall full of wonderful vintage costume jewelry. 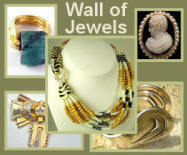 A free online photo gallery and community for Jewelry Design. Try Amazon for new and used!